1. Marinate lamb with yoghurt and salt for 1 hour. 2. Heat the oil in a pot. 3. Crackle the whole spices. 4. Add onions, saute till light brown. 5. Add ginger garlic paste. 6. Saute for 4 to 5 minutes. 7. Stir in the spices. 8. Add marinated lamb, bring to the boil, reduce flame and simmer, adding 2 tsp water at regular intervals. 9. Cook until the lamb becomes tender. 10. Add the remaining ingredients. 11. Cook, covered on low heat till the lamb is tender and evenly coated with the marinade. 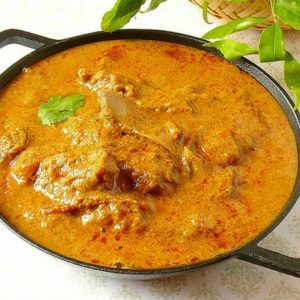 Feel free to comment or share your thoughts on this Rara Gosht Recipe from Awesome Cuisine.